So I have a new favorite board on Pinterest - and after you see this - you might too. 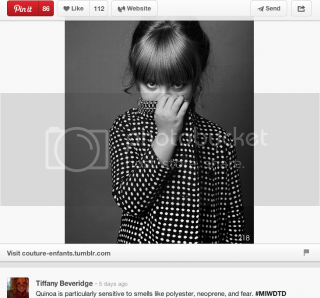 It's Tiffany Beveridge's "My Imaginary Well-Dressed Toddler Daughter" board - and its hilarious. Her imaginary daughter's name is Quinoa. Which alone makes me giggle. Check out the image on the left. The tag line is: "Quinoa is particularly sensitive to smells like polyester, neoprene and fear." Obviously others have found this board and its hilarity - because it has almost 58,000 followers. And she has a twitter account -@ImaginaryQuinoa and the whole thing really reminds me of Suri's Burn Book - which is another great sarcastic read. Today's NaBloPoMo prompt is to talk about a missed connection. Which I would do if I could think of one. I think this post is more fun without it though. Maybe its the new mom in me - but I hope you enjoy this kid humor as much as I do!